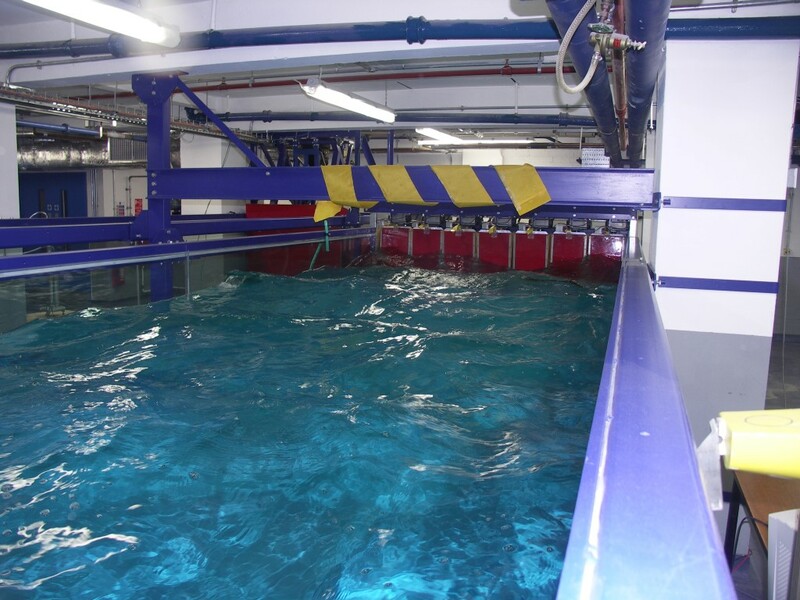 Our flap wave machines are designed for generating deep water ocean waves and are used for model testing of ships, renewable energy devices and offshore structures. 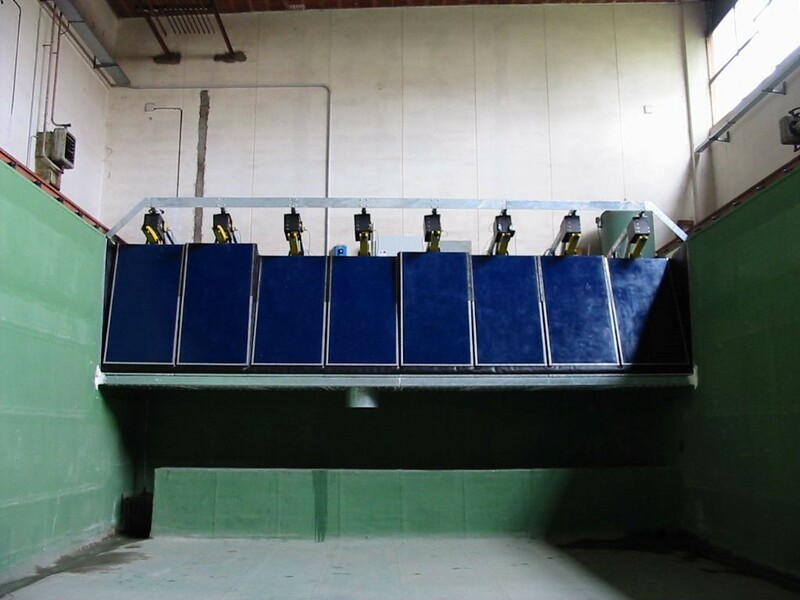 Our machines are capable of generating regular waves up to 1m peak to trough, and are designed to fit our customer’s specific requirements. Flap width and height can be tailored to fit a tank's wave specifications. 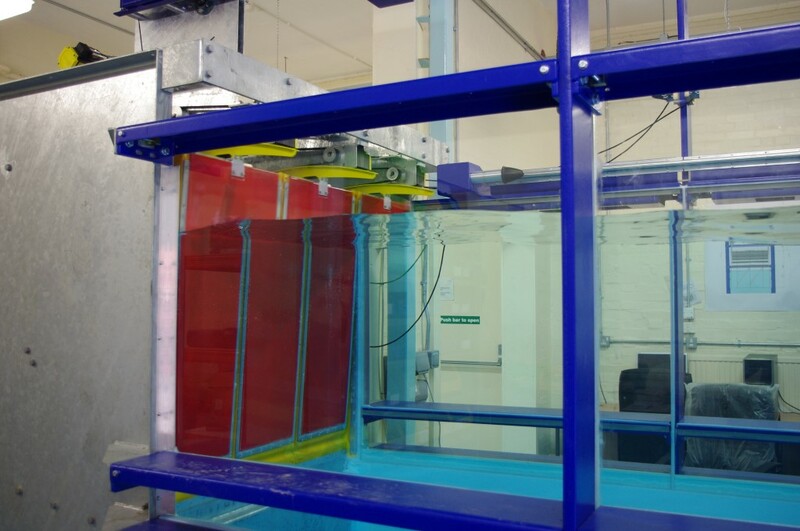 Paddles can be installed individually in narrow tanks or multiple flaps can be used together in wider tanks to create angled waves or absorb cross waves. All Edinburgh Designs' paddles are fitted with force-based wave absorption and are controlled using our sophisticated wave generating software suite. Fully definable sine and random sea state waves. The drive system consists of regular standard parts and can be replaced by technicians. Custom hinge depth and paddle width to fit your tank. Call +44 131 662 4748 or email us to learn more about how we would develop your facility, or read more about wavemaker design. 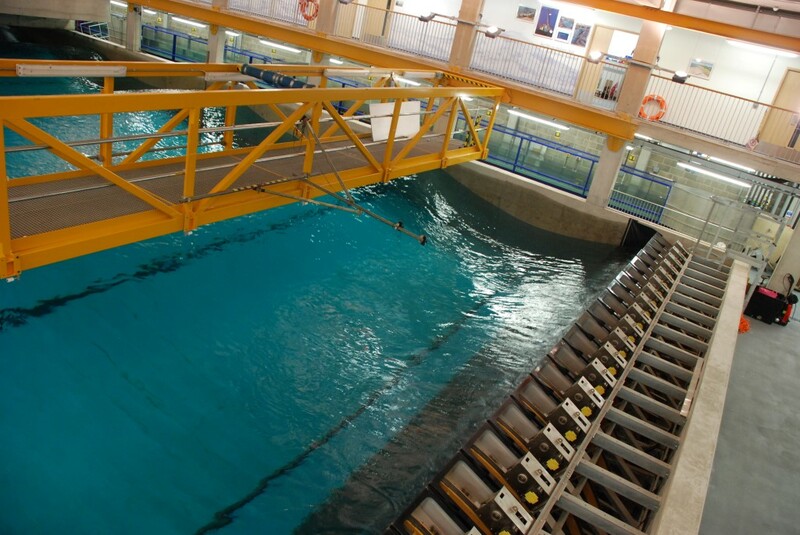 All the paddles are driven by a single Windows PC running Edinburgh Designs' wave control software. Traditionally wavemakers work with a position feedback control system to create waves. 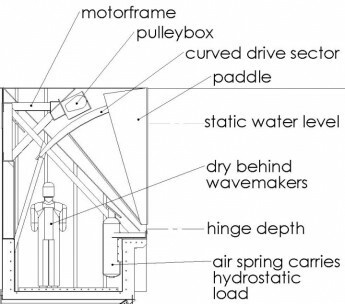 This has the disadvantage that the swept volume of the paddle is dependent on the water level in front of the paddle. 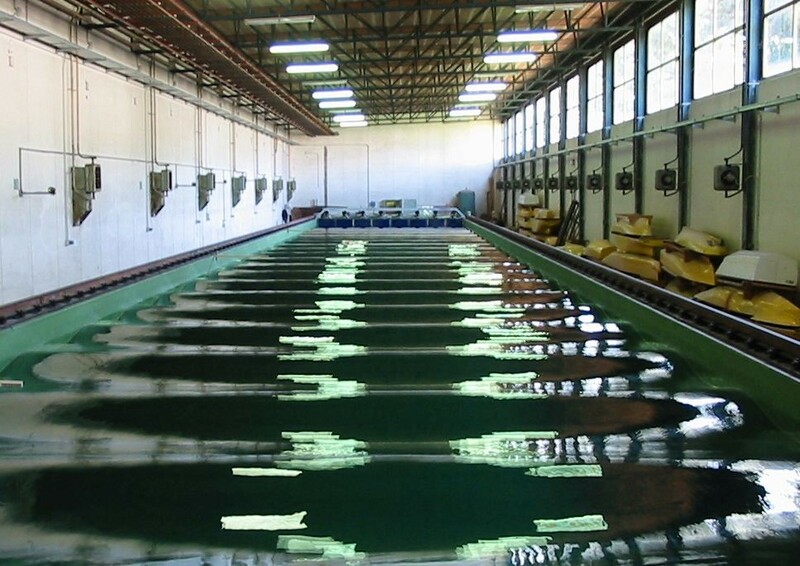 In position controlled machines the generated wave height is influenced by many factors including the size of reflected waves from models, poor quality beaches or seiche waves in the tank. See video for more information. 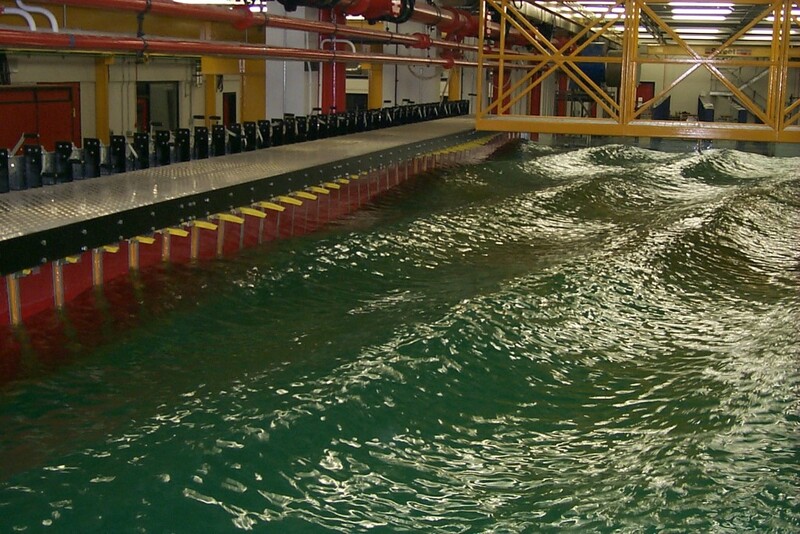 The Edinburgh Designs force controlled wavemaker measures the incoming wave and corrects the paddle motion to absorb it. The resultant wave field is totally predictable even with highly reflective models. Repeatability is better than 1% allowing results from multiple sequential runs to be combined. The force absorption technique uses two reliable transducers well above the waterline. The technique is significantly easier to use than wavegauge absorption because the transducers do not require setting up or calibration. Each paddle has a robust brushless AC servomotor that drives a belt running over a curved guide on the top of the paddle. 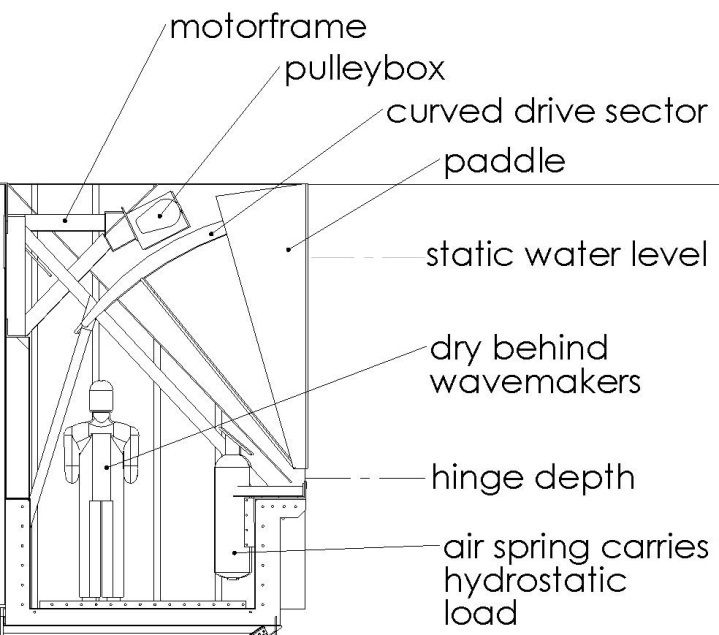 The water height on the paddle is measured via a force transducer. The control electronics, power amplifier and power supply are contained in a self contained robust steel cabinet. Maintenance is simple with all major components easily accessible well above the waterline. The system consists of a bank of flap wavemakers, consisting of wedge shaped glass fibre or stainless steel paddles each pivoted about a hinge on the tapered end. The flaps are dry back and sealed with a rolling fabric gusset seal so motion only makes waves in the water to the front. Each individual flap is driven by an electric servo-motor via a belt which runs over a curved sector attached to the paddle top. Springs or pneumatics offset the hydrostatic force. Force transducers sense the wavemaking forces and encoders measure the paddle position. Edinburgh designs has built many different sized flap wavemakers. 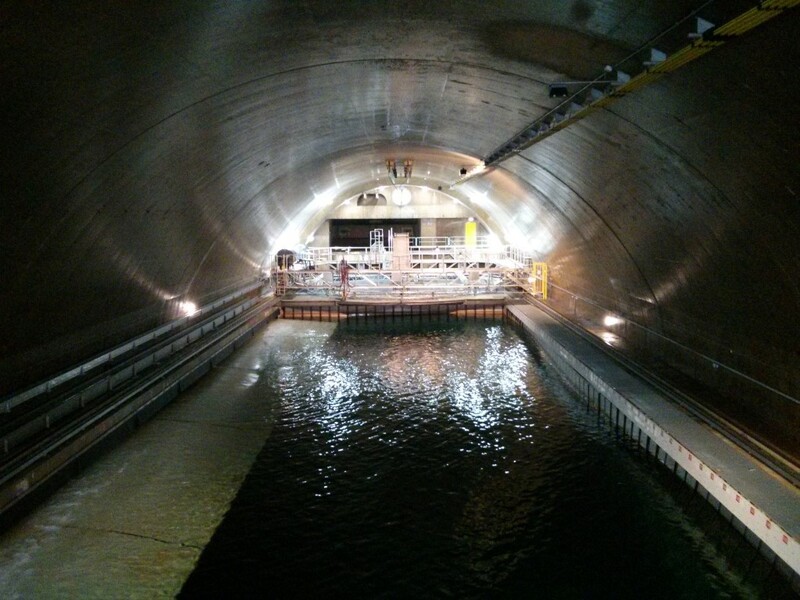 The majority are made to upgrade existing wave tanks so are built to fit the customers exact requirements. Hinge depth: 0.7m, 0.9m, 1.2m 1.5m, 1.8m, 2.2m, 2.5m, 2.8m or custom. Width: Typically 0.3m to 1.5m depending on tank width and number of paddles. 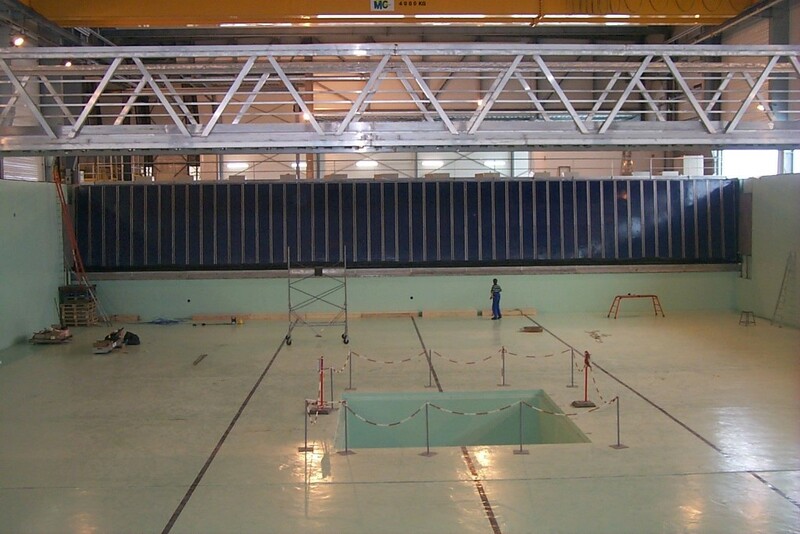 Flume tanks constructed from steel, glass and/or glass reinforced fibre (GRP) supplied by the client or Edinburgh Designs.